The community of Redland is an agricultural area in Miami-Dade County. Redland was named for the pockets of red clay once common in the area and the singular community name “Redland” was to help distinguish the town from Redlands, California. 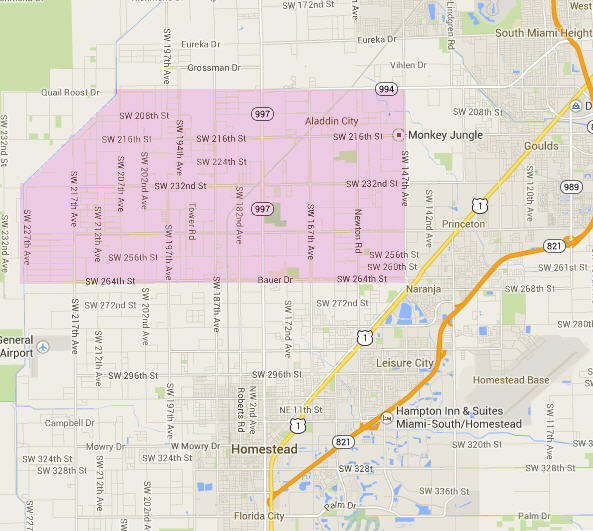 Redland is located north of Homestead and south of Kendall, between Krome Avenue east to SW 227th Avenue. The population is approximately over 10,000 residents. The history of Redland began with the formation of Miami in the early 1900s during Henry Flagler’s railroad expansion. The original homesteaders created a way for working through the difficult soil, called plow-breaking. This revolutionized farming and the area was known as the “garden capital of the world”. Today, Redland has many historic markers. By law, most of the homes built in Redland today must be a minimum of 5 acres of land to preserve the area and prevent development. Redland is a designated Wild Bird Sanctuary and peacocks live freely within the land. Some of the interesting places to visit at Redland include Redland Farmer’s Market, Knaus Berry Farm and Schneby Redland’s Winery. The Redland Farmer’s Market provides local farmers the opportunity to sell their crops directly to the shopper. Some of the produce sold includes eggs, berries, avocados, strawberries, lemons, and green vegetables. Knaus Berry Farm has delicious shakes, cinnamon buns and other goodies. It is closed during summer months and holidays and operates between November through mid-April. Schnebly Redland’s Winery produces wine with the tropical fruits in South Florida. The winery hosts events and has live music and picnic tables for those to enjoy so visitors can bring their own food. There are also tastings available for those who want to try different wines. The schools in Redland include Redland Elementary and Redland Middle, Redland Christian Academy and University of Florida Tropical Research and Education Center. The University of Florida Tropical Research and Education Center was established in 1929 and is based on teaching local tropical fruits, vegetable crops, biofuel crops, and natural resources. The community of Redland has been a source of wonder to agriculturalists, botanists and naturalists around the world including David Fairchild, an American botanist and plant explorer from the late 1800s and early 1900s. In the United States, Florida is the only state that can grow tomatoes supplied by Redland farms during the winter. Redland is a relaxing community and a perfect place to live for families and the enthusiastic agriculturalist. If you have any interest living in Redland, contact us and we will assist you with your real estate needs. Waiting to Buy a Home? What’s in Store for the Housing Market in 2018?